The Jeep Gladiator is back and better than ever. This Jeep has 4×4 capabilities to safely navigate any terrain that you encounter. Are you unexpectedly traveling off the beaten path? No problem! This car won’t only take you on your adventure, but it will seamlessly become part of it as well. The engine is 3.6L V6 with 280 horsepower and 265 pounds per foot of torque. Plus, the Gladiator is the only open-air pickup truck in the industry and is best in class for both towing and payload! You may not think of Jeep when you think of a pickup truck, but the 2020 Gladiator challenges your preconceived notions. 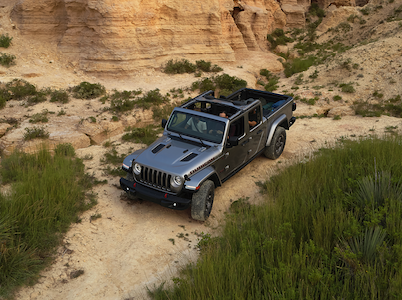 The foundation of the Gladiator is the Wrangler, so you’ll know that it is reliable. You can also expect to see features on this vehicle such as locking axles, a limited-slip differential, 33-inch all-terrain tires, and electronically disconnecting anti-roll bars. Do you unexpectedly have to drive through water? For the 2020 Jeep Gladiator, that’s no problem, as it can wade through up to 30 inches of standing water! Do you need a heavy duty truck to accompany you on all of your outdoor adventures? Look no further than the 2020 Jeep Gladiator, as its design allows it to tow up to 7,650 pounds! Regardless of what you need to pull, such as a camper, a boat, a trailer or a moving truck, the Gladiator is up for the challenge. Rest assured that the iconic Jeep grille is still prominent in the Gladiator, but it has been widened to allow for sufficient cooling if it is working overdrive to haul something heavy. Not only is the 2020 Jeep Gladiator functional, but it looks good as well. It is made from four aluminum doors to ensure the structure is lightweight. Of course, it also comes with a removable roof and a windshield that folds down in addition to removable doors. Choose from both hardtop and soft top options to best suit your lifestyle. The truck bed includes a three-position tailgate, a roll-up tonneau cover as well as an available 115-volt power outlet. Throughout the interior, you’ll find an available Industry-Exclusive removable Bluetooth wireless speaker, leather-trimmed seats and innovative storage solutions. 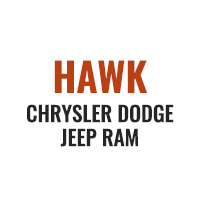 Stop by Hawk CDJ of Forest Park to test drive the all-new 2020 Jeep Gladiator today!